a) The area was one of settlement early in the colony in the 1830s and 40s. b) The Church cemetery contains the graves of many early settlers and their descendants. c) The cemetery is of interest to family historians. d) The complex of Church, grounds (including slip-rail fences and early plantings), and cemetery act as a cogent statement of an early Australian lifestyle. It has been in use for 112 years. a) The contribution of the Cornish to our history and culture is demonstrated in this site area. b) The Church, grounds and cemetery provide a concrete link between modern Cornish born or descended Cornish Australians and their kinsmen of last century. ------>>>And there were more to help elsewhere. 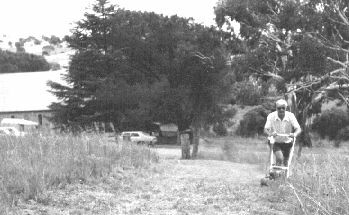 After contacting Raymond Hawke and discussing a proposal to provide a group who would assist in a tidying up campaign around the Chapel and the cemetery, CANSW members went to Byng in 1976 to start on mowing grass and clearing undergrowth. This activity has become a regular effort by CANSW members over the years since that time. One concern in the summer months was Beware Snakes. 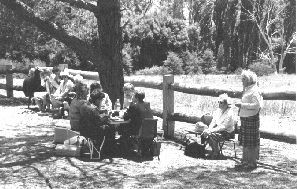 With the provision of a heritage grant in 1987, it became possible to launch other site activities, well supported by local folk who had noted the effort being put into the improvement of the site as well as the Chapel. A new slip-rail fence was constructed by Colin Harris and his son, using age-old methods, and the fencing around the Chapel was also remade. Colin lived in the area with his wife Evelyn nee Spicer who was also very active in the work being done. CANSW members gave assistance in fencing efforts. The appearance of the cemetery was completely changed by the clean up which had taken place and by the new fencing. Another extremely active couple were the Campbells, Barry and Kerry nee Spicer. Towards the end of 1987, Barry worked through five consecutive weekends on the upgrade of the Chapel and its surrounds. The whole operation had become very much a joint effort with CANSW members and the local folk, so much so that a splendid vellum, created by member Geoff Ford, is now in the Chapel, listing the names of CANSW members involved with the maintenance and restoration work. 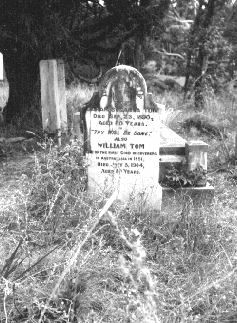 By October 1980, the inscriptions on the tombstones in the Byng Cemetery had been transcribed by G.E. and Y.M. Tracey. These records cover an surprising span of time from 1834 up to 1970. Ultimately, it is hoped that records of births and marriages can also be extracted and placed in these Web pages because they do represent a very "concrete link" to the descendants of the people who once lived and worked around the Cornish Settlement and then Byng. Who knows? It may also be of value to those elsewhere in Australia and overseas, wishing to establish some link with "kinsmen of the last century"! The CANSW is grateful for the opportunity to present at least part of the records in the table below. Spicer James Caleb 1920 -- Private 5119 5th Mach. Gun Btn. 1. The original Tracey list has been sorted first alphabetically and then on Year of Death to make it easier to find a particular person. Some inscriptions are on the same tombstone and may refer to a person 'above'. In these cases, care has been taken to ensure that the name of the person is given instead the word 'above'. 2. In the inscriptions, where Cornwall is named as the origin of the person, the usual abbreviation 'CON' is used to decrease the amount of space required in the table. Some inscriptions were already abbreviated. Joseph Stock, d. 26 April 1880, certified by John Randell, a friend at Lewis Ponds; buried 28 April 1880 at Byng. Occupation, Labourer: 26 years in NSW. The Cornish Settlement starts: Byng & its Chapel - Bethel Rock and 'Parson' Tom (Byng Two) = A Visit to the Orange & District Historical Museum - William Tom's Pipe Organ & a Tribute to William & Ann Tom - Wesleyan Baptisms at Byng - The First Australian Payable Gold Discovery (Gold from Ophir). This page was constructed by the CANSW Webmaster, Dr John L. Symonds and upgraded 1 June 1998.